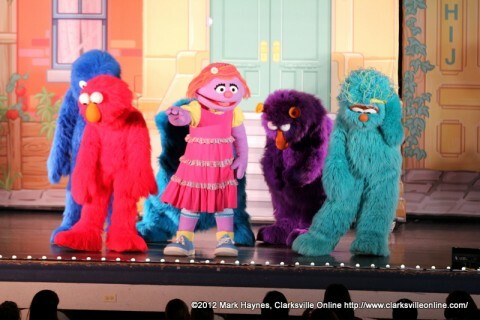 Fort Campbell, KY – On April 14th and 15th, the Sesame Street and USO Experience for Military Families USO tour put on three free performances for Fort Campbell families active duty, Retirees, National Guard, reserves and Department of Defense Civilians. Over 1,800 people came out to watch the shows. The 30 minute performance was a special event for the military community since it is specifically designed to educate children about coping with military deployments and homecomings. 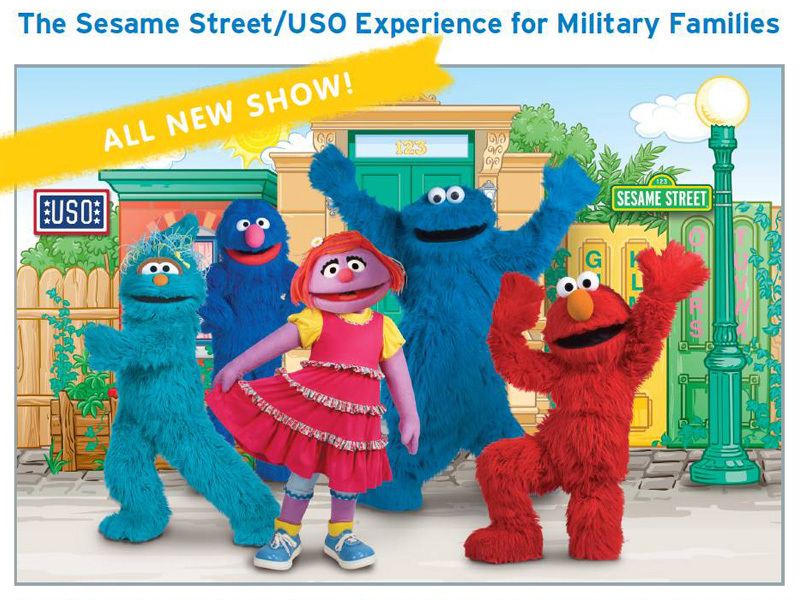 The Sesame Street and USO Experience for Military Families is a free, traveling USO tour based on Sesame Workshop’s award winning Talk, Listen, Connect initiative. The show is about a little girl named Katie. She is a new military Muppet that was created by Sesame Street specifically for this tour and military families. Katie gets news that she has to move to a new base again. It’s Katie having to deal with leaving her friends behind that she had just made at the base she is leaving and then making new friends at the base she is going to. With the help of her friends Elmo, Cookie Monster, Honker, Rosita and Grover, they go on a journey and share an experience of what it’s like to move to a new base in the military today. Katie gets news that she has to move to a new base. “Children idolize the Sesame Street characters so to make a military Muppet, Katie, personalizes it for them because it’s a little girl that is going through the exact things that they are having to deal with in their own lives.” says Company Manager Tom Zaizar. The show was created for military families because they are sacrificing so much for their country. “We just want to let the soldiers and military families know how much we appreciate what they’ve done for us as a country. 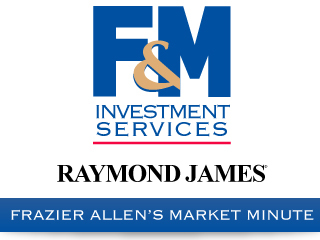 To thank them for everything that they have done and sacrificed.” said Zaizar. The Sesame Street and USO Experience for Military Families USO tour will be traveling for the next eight months to military bases around the United States. Click here for their tour dates. The Sesame Street/USO Experience for Military Families – the USO’s longest running, free traveling tour based on Sesame Street’s military family initiative – began rolling onto U.S. military installations across the country with the first event taking place at Scott Air Force Base in Illinois on April 7th. Created exclusively for this tour, Katie was first introduced to military families in April 2011 by First Lady Michelle Obama and Dr. Jill Biden at a Joining Forces rally in Columbus, Ohio. Produced in partnership with VEE, this year’s 70-stop tour showcases the power of friendship when Elmo and his Sesame pals help Katie open up about her fears and excitement as she deals with moving to a new place and making new friends. The show comprises a fun-filled character performance with special giveaways and outreach materials for those who attend. Since its debut in July 2008, the Sesame Street/USO Experience for Military Families has taken its message to more than 248,000 troops and military families and performed 433 shows on 131 military bases in 33 states and eleven countries.